When Bruce looked at where his electricity was going, he found that about a quarter of his total electricity use was to run his pool pump. He decided to install a new pump that would be run from PV modules. Bruce's report gives details on the design and installation of the new pump, and on how the economics is working out. The drop in PV module prices in the 6 years since the system was installed, the payback period would now be substantially shorter. 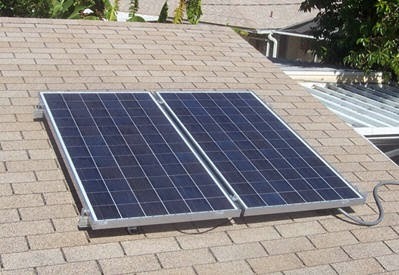 The installation is simple consisting of only the two 170 watt PV panels (above), a controller, and the DC powered pool pump itself. 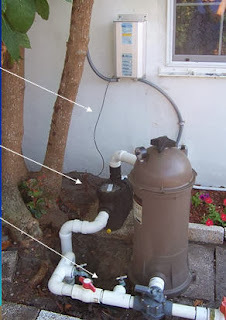 Given the efficiency of DC pumps and the minimal losses its a very efficient setup. An alternative to Bruce's approach would be to retain the existing AC pool pump and add a grid-tie PV system for the whole house that would power both the pool and the rest of the house loads. This is appealing in that one system does both jobs, but the low efficiency of typical AC pool pumps appears to require a much larger PV array (perhaps a 3000 watt PV array just to drive a 1.5 hp AC pool pump 8 hours a day). So, the dedicated PV array to drive the DC pool pump appears to be the more cost effective solution -- do you agree? Two speed AC pool pumps run for longer periods at lower speeds also appear to offer a larger saving in electricity at a modest initial cost. I've added a small section on powering pool pumps efficiently that includes Bruce's PV powered pump as well as some other ideas on efficient pool pumps. If you have any other ideas or thoughts, lets hear them. What a great idea for someone to get their feet wet in solar technology, and I appreciate your giving some alternatives to the original idea. I agree with you that the dedicated PC array for driving the pool pump appears to be the cheaper solution overall.